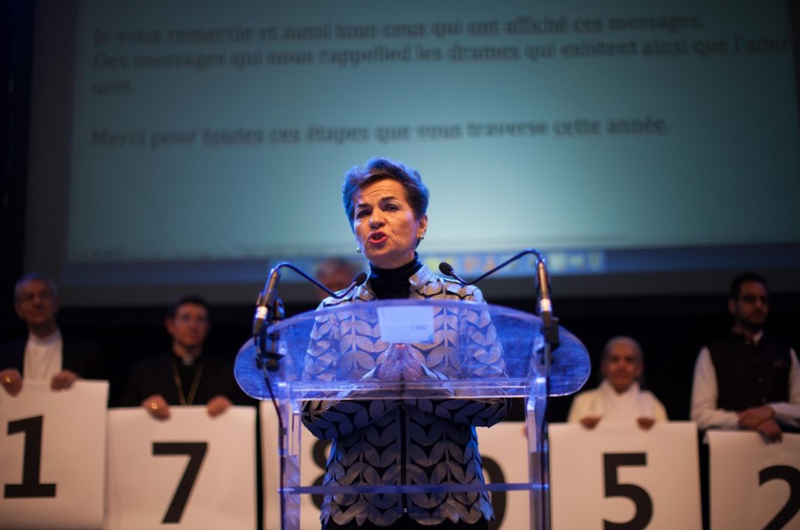 November 28, 2015 – Our movement today delivered over 840,000 Catholic Climate Petition signatures to political authorities of the United Nations and the French government, in an interfaith event in Paris. The 840,000 GCCM signatures. From left to right: Bernd Nilles, Secretary General of CIDSE; Yeb Saño, leader of the People’s Pilgrimage; Tomás Insua, Global Coordinator of the Global Catholic Climate Movement; Mgr Josef Sayer (Germany); Cardinal Cláudio Hummes OFM, President of Pan-Amazonian Ecclesial Network; Bishop of St Denis; Michel Roy, Secretary General of Caritas Internationalis. 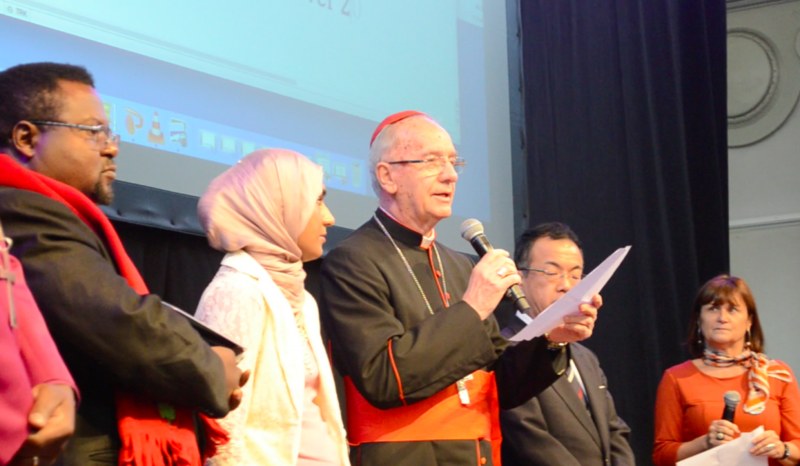 Cardinal Claudio Hummes (Archbishop Emeritus of Sao Paulo, Brazil, and former Prefect of the Congregation for the Clergy) was our movement’s spokesperson in the event, saying “Today we bring to Paris the voices of over 800,000 faithful who signed the Catholic Climate Petition. Families, youth groups, parish communities, lay movements, religious congregations, and Cardinals and Bishops like myself, have mobilized to ask for intergenerational and intragenerational solidarity” (see full speech below). 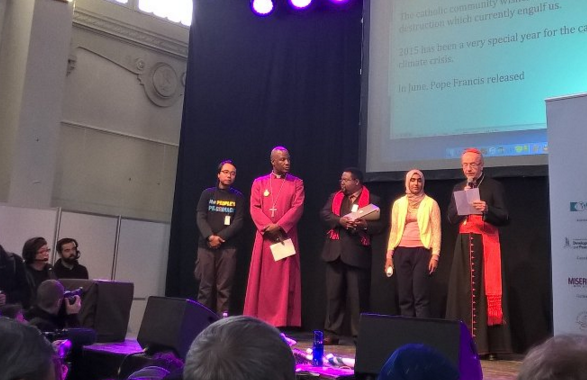 The speakers of other faiths were the Most Rev Dr Thabo Makgoba (Anglican Archbishop of Cape Town), Rev. Kyoichi Sugino (Buddhist); Reverend Mithika Mwenda, Coordinator of the Pan African Climate Justice Alliance; the former climate negotiator for the Philippines, Yeb Sano; and Ms. Lotifa Begum of Islamic Relief Worldwide. The Catholic signatures were added to a global counter of over 1,780,000, joining the signatures of ACT Alliance, Religions for Peace and Our Voices. The interfaith event was a joyful and exciting celebration and call to action (here‘s a wonderful summary of the event). The petition signatures were received by Christina Figueres, Executive Secretary of the U.N. Climate Change Secretariat, and Nicolas Hulot, Special Envoy of the French President for the Protection of the Planet. Christiana Figueres, the UN Climate Chief, thanks the faithful for such a strong commitment for climate justice. It’s a joy to be together with all of you today. The Catholic community joins people of all faiths to express our grave concern with “the spiral of self-destruction which currently engulfs us” (LS 163) and to make a strong call for climate justice. 2015 has been a very special year for the Catholic Church and her response to the climate crisis. In June, Pope Francis released his groundbreaking encyclical Laudato Si’, which compellingly framed the environmental crisis as a moral crisis. In October, my brother Cardinals, Bishops and Patriarchs from the whole world released the “APPEAL TO COP21 NEGOTIATING PARTIES”, calling for a fair, binding and truly transformational climate agreement in Paris. And in this weekend of November, it is the grassroots of the Church who strongly demand climate justice, under the banner of the Global Catholic Climate Movement. Today, we bring to Paris the voices of over 800,000 faithful who signed the Catholic Climate Petition. Families, youth groups, parish communities, lay movements, religious congregations, and Cardinals and Bishops like myself, have mobilized to ask for intergenerational and intragenerational solidarity. below the dangerous threshold of 1.5°C. As the Bishops’ Appeal states, we need to “put an end to the fossil fuel era” and “set a goal for complete decarbonisation by 2050”. And we ask wealthier countries to aid the world’s poorest to cope with climate change impacts, by providing robust climate finance. And tomorrow, we will join the massive Global Climate March in over 2000 cities worldwide, showing our commitment in the streets. 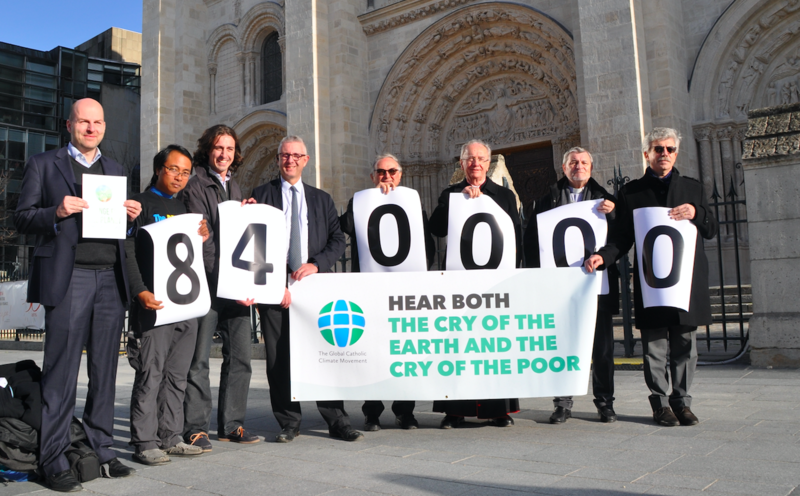 I pray for political leaders to “hear both the cry of the earth and the cry of the poor” (LS 49) and to respond to the climate justice demand from faith communities. Time is running out. Let’s pray and act for Climate Justice!